Arrival at the villa will bring you to the private parking space – through a return transfer from the airport is included in the rental price, so you may want to skip car-hire altogether! A rustic pathway leads you into the grounds, with the large kitchen immediately ahead. Here you will find plenty of space for meal prep, as well as a breakfast bar for a more relaxed dining environment. Through a set of large patio doors is the indoor dining area. A delightful dining table for eight sits below a beautiful vaulted timber ceiling. Beyond the table is the first of the spacious living areas – a luxurious and elegant air-conditioned living room with two long sofas around a large marble coffee table, sitting in front of the satellite TV and DVD player, is the perfect spot for a lazy evening in. Custom artwork adorns the walls, and a private gym completes the common interior areas. All four elegant, spacious air-conditioned bedrooms have fabulous exposed timber ceilings and teak flooring and are equipped with fitted wardrobes, walk-in closets and sublime ensuite facilities, while two also enjoy a writing desk and a TV with DVD player. All four are located around the beautiful tropical Thai garden centrepiece, with large French doors allowing you to fill the room with the natural air from the sea and the sight of exotic trees and birds. The master bedroom also has a beautiful sea view. All four ensuite, marble bathrooms come equipped with 100% cotton bathrobes and slippers and even luxurious bathtubs for two! In the exquisite garden, a 15x5 meter private swimming pool, a beautiful row of palm trees and a strip of shimmering white sand are all that stand between you and the vast blue sea, with stunning views of the nearby islands – creating a perfect silhouette in the famous sunsets. By the pool a traditional Balinese bed with silky blue drapes provides a tranquil spot to relax, feeling the cold sea breeze wash over you in the heat of the tropical sun. By the bed, a large wooden dining table for eight offers alfresco meals with quite a view! Weaving through the garden space is a beautifully maintained lawn with all kinds of exotic plants and flowers. The conservatory provides a sofa in front of the bar with a sink, fridge and a Denon Stereo, and doubles up as an open-air cinema with an overhead projector and retractable screen. Cheerful, friendly and professional staff will be at your service throughout your stay. 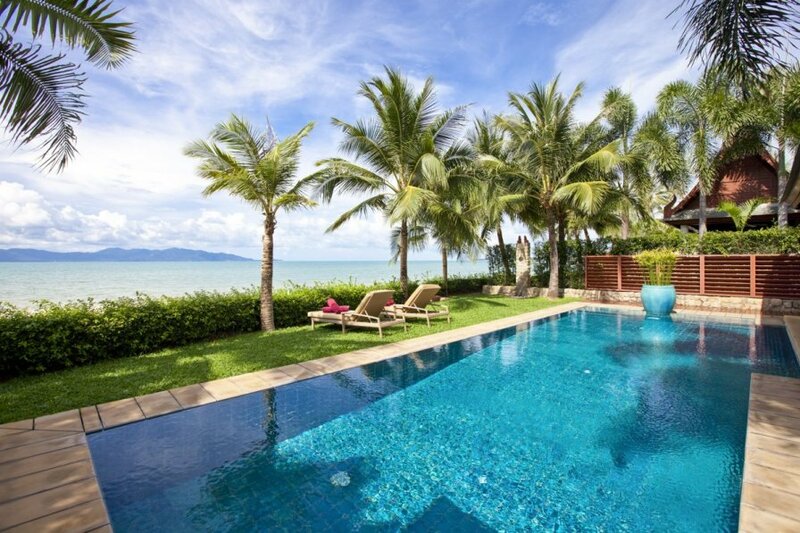 Villa Naowarat is located on the tranquil Mae Nam beach, a five-kilometre stretch of palm-lined, pristine white sand famous for its glorious sunsets.